When: Sunday 9th August 2015, 10.00am to 4.00pm. Ah, the good old British summer holiday! We look forward to it with guarded optimism and hope, but we know from experience that things don’t always go to plan. 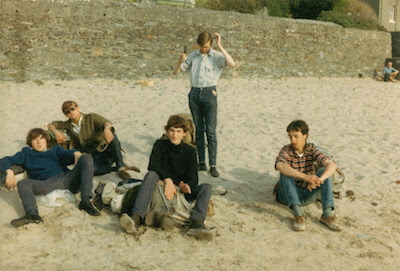 We might get sunburn, or a soaking, but we’ve always made the best of it. No matter what the unpredictable weather throws at us on Sunday 9th August, the Vintage Village is under cover in the marvellous Victorian market hall so why not spend some of your holiday time perusing the top quality genuine vintage clothing and accessories for ladies and gents, not to mention costume jewellery, homeware, decorative items, furniture, textiles, luggage, toys, books, vinyl, collectables and oddities, all artfully displayed for your browsing pleasure? We take our refreshments just as seriously as our vintage, and you can look forward to the multi-award-winning Lord of the Pies with their handmade gourmet British pies, Caarma Curries with their authentic Bengali and South Asian dishes, and Kandoo Coffee for espresso-based beverages and various teas. Popscycle will be - pun alert! - pedalling ice creams and lollies from his two-wheeled American dream machine Schwinn, and there’s the reliably fantastic Stuart Thornley Cake Design (they’ve won LOTS of awards too!) for irresistible sweet baked treats you can eat at the fair, or take home to enjoy later. If you can wait that long! Let us know if you're coming on our Facebook event page, and please feel free to invite all your friends! 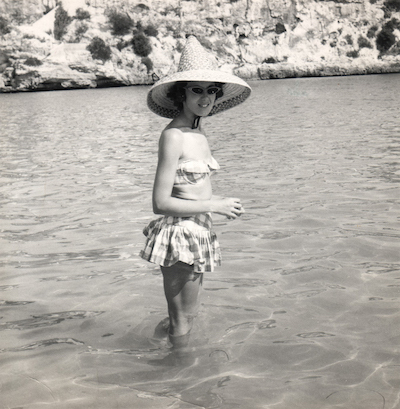 This early 1960s lady knows her sun hats. And cat's-eye sunglasses. And strapless plaid bikinis with pleated skirt bottoms. Look and learn! 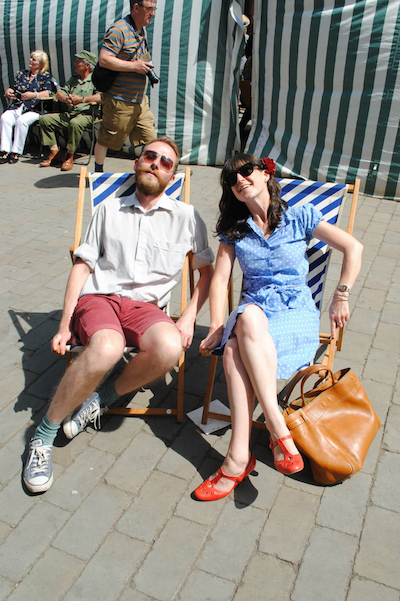 This month's poster/flyer stars are Paul and Cathy, snapped at last year's July fair with their newly-acquired deckchairs by Frankie Cooksey Photography. Are we having fun yet? 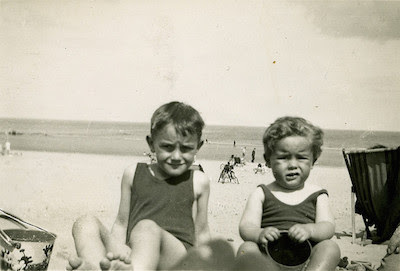 These two little chaps in this 1936 photograph haven't quite made up their minds! You'll be guaranteed loads of fascinating fun with the new issue of Vintagexplorer magazine, which is chock-full of entertaining articles about entertainment! Grab yourself a free copy at our Summer Holiday Fair! 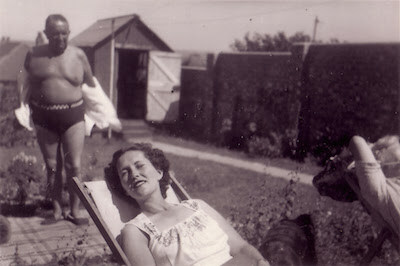 Your classic staycation, 1930s style. Dad always has to get his shirt off in the garden when the sun is out!